In case you missed the defensive battle last night in the Alamo Bowl, I suggest you check out the highlights because this one provided some fireworks. By defensive battle, I mean that Baylor and Washington combined for 123 points and 17 TDs (holy hell). Surprisingly, I don’t think RG3 was the story of the game, nor do I think Baylor’s running back, Terrance Ganaway, was the MVP. 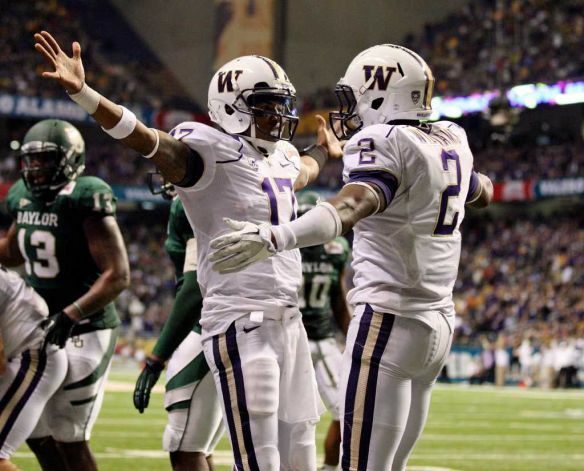 I’m talking about Washington sophomore quarterback, Keith Price. This guy threw for 4 TDs, rushed for another 3 and dropped 438 yards on the Baylor D. I was watching the highlights on Sportscenter last night and they totally passed him over. I mean he legitimately almost beat the #12 ranked Baylor single handed. He made virtually no mistakes, out performed the Heisman winner and broke multiple bowl records. I am an enormous fan of Sportscenter, but if they have one flaw its really focusing on superstars and not top performances. This should have been the real story of this game, even though Baylor hoisted the trophy, and he got almost no air time. I mean Price is probably 19 years old and he’s already looking like a high first round draft pick in the upcoming years. Oh, and he’s from Compton. Straight G.
This entry was posted in College and tagged baylor, Ganaway, Keith Price, RG3, Washington by nolankartholl. Bookmark the permalink.